There are 4 trails in Cedar Hill State Park. The largest (Dorba) is a shared use mountain biking and hiking trail. The remaining trails (Overlook, Duck Pond, and Talala) are only for hiking. The trails are closed if they are wet, to prevent the paths from erosion, and closures are common during times of the year when it rains often. Fortunately you can check on the status of the trails before you visit the park by calling 972-291-3900. You are allowed to have your dog out on the trails, provided they are kept on a leash. The Dorba trail was primarily created through the efforts of the Dallas Off Road Bicycle Association. They worked closely with Cedar Hill State Park management to help design and build the this trail. Their efforts ened up returning a big dividend for off road bicyclists as the trail is now considered one the top mountain bike trails in the state. Dorba has has three loops: Short (2.5 Miles), Middle (7 Miles) and Outer (10+ miles). The paths pass through wooded areas but are fairly open for much of their length. Having the sun beating down on you can make a warm summer hike considerable warmer - be sure to plan ahead and bring an adequate amount of water with you. The trail is what you might expect from a design made for mountain biking. There are plenty of twists, turns, and ups and downs. None of this is too strenuous but if you are looking for an easy, short hike you will be better of using one of the other three trails. The most important rule on the Dorba trail is that bikers travel in a clockwise direction and hikers travel counter-clockwise. When hiking make sure you are attentive to watching and listening for approaching bicyclists. Their faster rate of travel, the many twists and turns of the trail, and the fact a biker cannot "hear" a walker all make it difficult for a rider to know there is a hiker ahead. On the other hand, if you are walking it is relatively easy for you to hear approaching riders - if you are paying attention. When you hear a bicyclist quickly find a place to stand, just off the trail, and allow the biker(s) to pass. You can watch a few short youtube videos taken along the Dorba trail if you want to see what it is like. 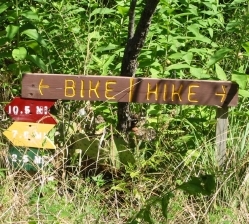 The overlook trail is found at the north end of Cedar Hill State Park and is accessed from the Shady Ridge Camping Area. There is a small creek crossing the trail at its very beginning but soon it begins to gain elevation and head up towards the overlook. Nothing spectacular is found along this trail although it is easy to negotiate and passes through some nice woodland areas. The real attraction of this trail, besides the little workout you get by walking up the hill, is the nice view of Joe Pool Lake you have from the lookout. The half-mile Duck Pond Trail is the shortest hiking trail in Cedar Hill State Park. This loop passes through small open fields, forest habitat, and along the edge of Duck Pond. There are also a few bridges along the way, as the winding path crosses over a small creek. The trail itself is rather wide throughout its course and the bridges prevent you from having to traverse any rough terrain. If you are just looking to stretch your legs without having to go on a rigorous trek, this is definitely the trail for you. Another trail also connects with the eastern edge of the circular Duck Pond trail. The path leads to one of the primitive camping areas and then the trail heads uphill to a lookout that is found opposite the Coyote Crossing camping area. The overlook is overgrown so it is difficult to get a good view of the small valley and the more distant ridge. Yet another trail branches off just before the lookout. This path leads across the park road and into the improved camping area. The Talala trail winds through open fields, wooded areas, and by and through a few small gullies. While you never get a view of the lake itself, the easternmost leg of the trail does pass close to the shore of Joe Pool Lake. The length of the trail and the ups and downs make it a bit more challenging than the Overlook and Duck Pond trails but it is not difficult for anyone who considers themselves a hiker. The trail is blazed but there are also a few places were determining the trail's location can be a little confusing. The herbaecous vegetation grows dense and tall in low lying areas and this can obscure the path for short stretches. Since this trail passes through a range of habitats it can provide the best opportunity in Cedar Hill State Park for seeing the greatest diversity of birds in a relatively short amount of time. Copyright © 2007-2018 Soulfulnature. Design by Andreas Viklund.